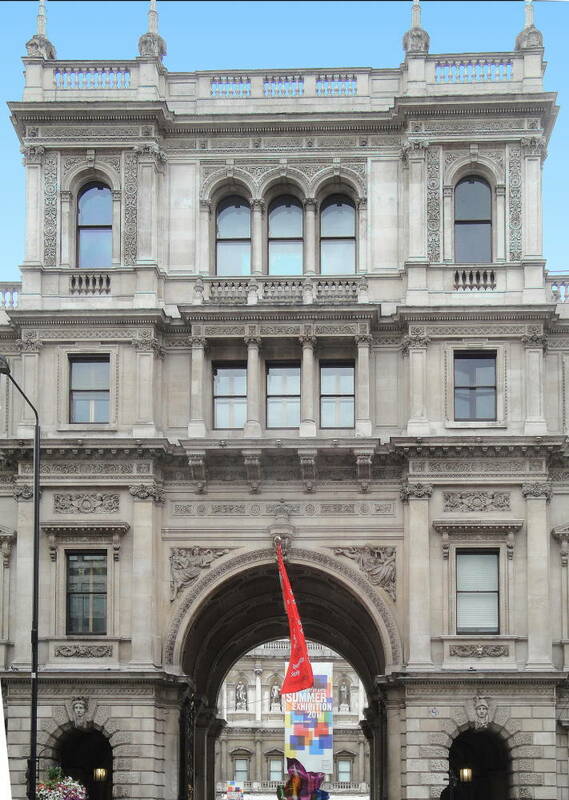 The Royal Academy of Arts, Burlington House, Piccadilly, London. Original house designed and partly built by Sir John Denham, 1664-5; completed, after he sold it in 1667, by Hugh May. Further work was done early in the 18c., first by James Gibbs, who built "a beautiful curved colonnade around the sides of the forecourt" (Weinreb et al. 115), and then by Colen Campbell, who provided a grand stone entry through to the forecourt, c. 1717-20. 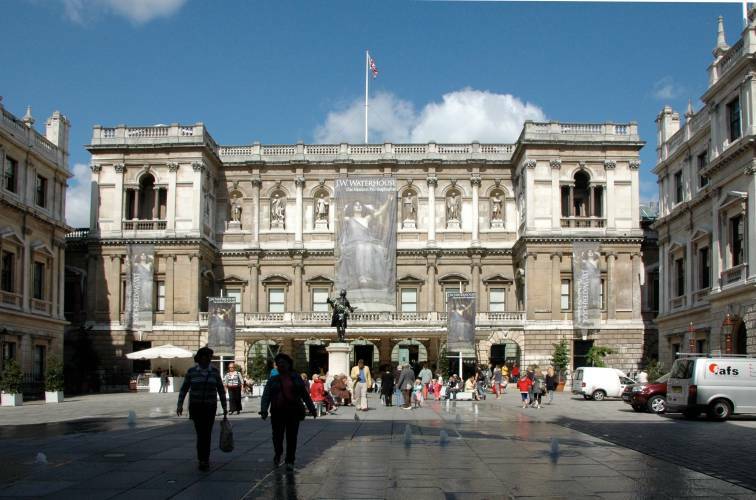 After the government bought Burlington House in 1854, and decided on its future role as premises for the Royal Academy and several learned institutions, Sydney Smirke was appointed as architect, and a building committee set up. Prominent members were E. M. Barry, Philip Hardwick, George Gilbert Scott and G. E. Street — an indication of the importance both of the site and its intended purpose. The new forecourt premises were built first, by the firm of Banks and Barry. Banks was Robert Richardson Banks (1813-1872), and Barry was Charles Barry Jnr (1823-1900), eldest son of Sir Charles Barry. This was the firm's most high-profile commission. The work was completed in May 1873, and (for example) the Society of Antiquaries had its first meeting in the new premises in January 1875. Meanwhile Smirke had added an extra storey to the main house in 1872-1874. E. M. Barry was responsible for extending and widening the central staircase in 1876; further alterations and additions, largely between the new galleries and the rest of the house, were made by Richard. Norman Shaw in 1883-5 (see Weinreb et al. 115-16, but note that this source wrongly ascribes the Piccadilly frontage and forecourt buildings to R. R. Banks and E. M. Barry — E. M. Barry was on the Building Committee but did not undertake the work). 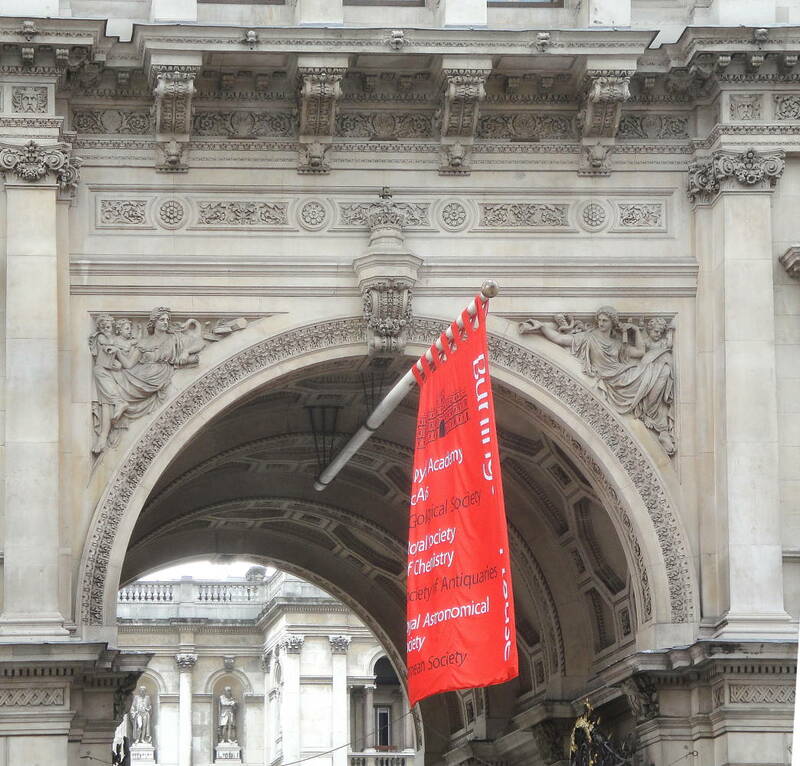 Smirke's work on the building, which lies behind the Piccadilly frontage of Burlington House, is often criticized. His additions "have had an unfortunate effect on Campbell's Palladian front, for although what Smirke did was generally right in principle, the manner was wrong" — mainly, it seems, because "his Corinthian order is raised on a high plinth, and the frieze of his entablature is much deeper than that of Campbell's Ionic order below," leading to an "apparent disproportion" (Sheppard). Weinreb, Ben, et al, eds. The London Encyclopaedia. 3rd ed. London: Macmillan, 2008.